What are Muscle Fibers Made Of? You may be surprised to know that you have up to 840 different muscles in your body. They come in different types: cardiac muscles, smooth muscles and skeletal muscles. Cardiac muscle forms the wall of the heart, and smooth muscle is inside blood vessels, the uterus, the walls of the intestine and the eye's internal muscles. Most of your body's muscles are skeletal muscles, which are attached to the bones and sometimes the skin, such as facial muscles. 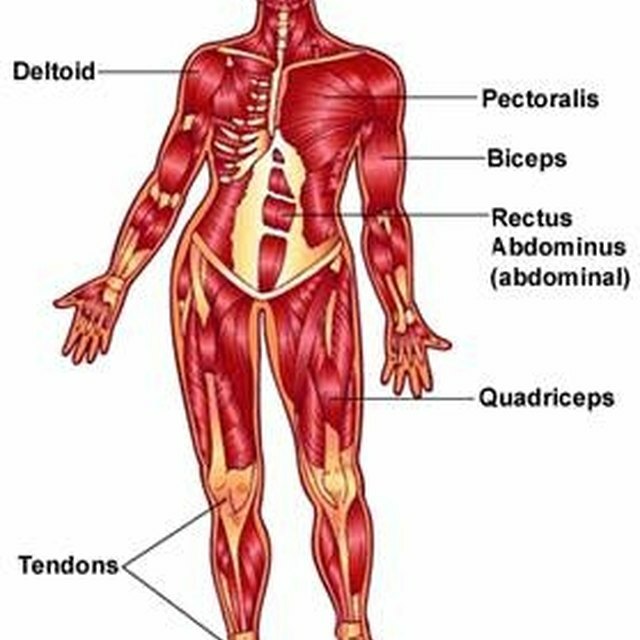 Skeletal muscles tighten to help limbs and other body parts move. Muscle consists of many individual muscle fibers – long, cylindrical cells made of a bundle of myofibrils, filaments arranged in segments known as sarcomeres. If you imagine the cross-section of a muscle, you would see bundles of fibers known as fasciculi, which are surrounded by a connective tissue called the perimysium. Each fasciculi contains from 10 to 100 muscle fibers, depending on the specific muscle. A large, strong muscle, such as those within your quadriceps, has a large number of fibers within each bundle. A smaller muscle, such as those in your hand, contains far fewer fibers per fasciculi. A muscle fiber is a single cell made of a bundle of myofibrils, filaments arranged in segments known as sarcomeres. Thin filaments are made of strands of a protein called actin, which is twisted around strands of a protein called tropomyosin. Thick filaments are made of a protein called myosin. Each individual muscle fiber is covered in an insulating fibrous connective tissue called endomysium. Muscle fibers range from 10 to 80 micrometers in diameter and may be up to 35 cm long. The two main types of skeletal muscle fiber are slow-twitch (ST or Type I) fibers and fast-twitch (FT or Type II) fibers. Slow-twitch fibers contract over a long period of time and are slow to fatigue. There are three different types of fast-twitch fibers. Type IIa has a moderately fast contraction time, and a relatively long resistance to fatigue. Type IIx has a fast contraction time and a moderate resistance to fatigue, and Type IIb has a very fast contraction time but tires very quickly. Different types of muscle fibers are needed to fulfill the body's different requirements, and most muscles have a combination of slow- and fast-twitch fibers. Slow-twitch fibers can hold contractions for long periods of time, while fast-twitch fibers create brief, powerful contractions. You use slow-twitch muscles in aerobic activities requiring a low exertion level over a long period of time, such as sitting, walking, cycling and long-distance running. You use fast-twitch muscles for anaerobic activities requiring a high-force movement, such as sprinting or jumping. Gillespie, Claire. "What are Muscle Fibers Made Of?" Sciencing, https://sciencing.com/muscle-fibers-made-5426027.html. 20 July 2018.